One of the most enjoyable meals The Luxury Travel Bible ever had was at The Rees Hotel Queenstown in New Zealand, partly because hotel Chief Executive Mark Rose matched food and wine perfectly for a tasting menu at the hotel's True South restaurant and was so eloquent in explaining his choices that we all felt enriched by the experience. Mark Rose talks about food and wine with true passion. Since then Mark has been one of our insiders sending despatches around the world to tell us of his latest gourmet adventure. From caviar to cuttlefish Mark seeks out the most unusual and the best worldwide. He's a Food Adventurer (capital F, capital A) and he's been our unofficial guide to fabulous food around the globe. Now we've decided to share some of his 'despatches' with you. Would he risk his life in the course of food exploration? Seems so. 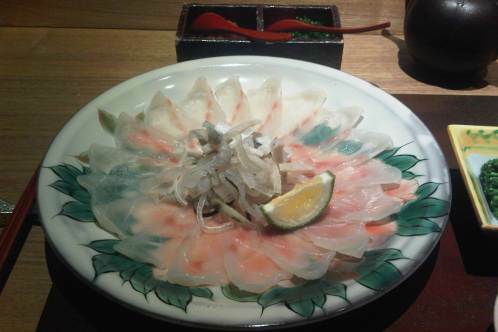 Mark recently sampled the notorious Puffer Fish at one of Toyko's most revered Fugu restaurants. But was it worth it? 'You will be pleased to know (or not) that I just lived through my first (and possibly last) Fugu experience' writes Mark Rose. Fugu or Puffer Fish is extremely poisonous if not prepared properly - chefs must undergo an eight year apprenticeship before applying for a licence to practise on the general public. Puffer Fish contains tetrodotoxin, a poison that causes its victims to become paralysed while still being fully conscious - death by asphyxiation follows, which accounts for five or six deaths each year in Japan. At this point you are probably wondering why I bothered - I guess that eating Fugu is a bit like jumping out of a plane and hoping that the parachute will open! - Pumpkin mousse with a bean curd top and ginger ice - which was up there with a liquorice parfait I once had, sweet but not sweet. Each course was presented beautifully but there was a distinct lack of theatre from the chef. (Surely a disappointment when you're eating something as dramatic as this - Ed) Having never eaten Fugu before there is no comparison that I can make - the dishes were interesting, tasty but no better than a piece of freshly caught Harpuka - the flavour and texture was almost identical. The taste stayed with me overnight (in a nice way) making it through two bouts of teeth cleaning and my mouth seemed slightly numb for a few hours - a sensation I am sure I have experienced in another life. I am often asked that if I was to die tomorrow what would my last meal be - having lived through my Fugu experience I can tell you it certainly wouldn't be Fugu! Rose was previously General Manager of Cameron House Hotel on Loch Lomond, Scotland and brought his Head Chef Ben Batterbury with him to run the Kitchen at the hotel's True South Dining Room. Batterbury bases his menus around local produce from high quality suppliers in the area south of Christchurch. So guest can expect seasonal treats such as West Coast whitebait, Stewart Island blue cod, and Haka Valley merino lamb, free range pork from Havoc, Gibbston Valley and Omaru Whitestone cheeses. Usukifugu Yamadaya is a fugu (blowfish, pufferfish) restaurant in Tokyo's Nishi-Azabu district. The three star Michelin restaurant has been serving fugu dishes since 2007.